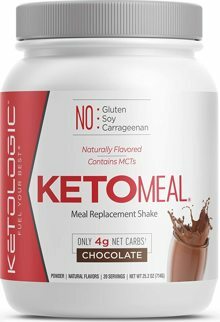 KetoLogic Meal Replacement is a convenient fuel source for those on a low-carb or ketogenic diet. KetoLogic Meal Replacement is anchored with Coconut Oil and Medium Chain Triglycerides (MCTs), which the body converts to ketones. Ketoners are a superior fuel that are efficiently used by muscles and the brain, generating more energy (ATP) per unit of oxygen consumed than carbs or protein.